As a journalist for many years, Dennis Hetzel says he sometimes was accused of writing fiction, but "Killing the Curse" is his first published novel. "Curse" recently won the award for "best general fiction" in the Great Southwest Book Festival competition and earlier won honorable mentions in the "best fiction" category of the San Francisco and Chicago book festival competitions. And now the book has received an "honorable mention" in sports fiction from Readers' Favorite! He began his career as a weekly newspaper sports editor in the Chicago suburbs and has been a reporter, editor, general manager and publisher at several newspapers, including the Cincinnati Enquirer and the York, Pa., Daily Record, where he was editor and publisher for 13 years. Dennis has won numerous awards for writing, newspaper industry leadership and community service, and also taught journalism at Penn State and Temple universities. Since late 2010, he has been executive director of the Ohio Newspaper Association in Columbus, Ohio, and also president of the Ohio Coalition for Open Government. A native of Chicago, and (of course) a Cubs fan, he has a degree in political science and a minor in journalism from Western Illinois University, where he met his wife, Cheryl. They have three grown children, a dog, a cat and a home they love in Holden Beach, North Carolina. Alongside his love of writing, Hetzel plays guitar in an acoustic trio, "Phil's Five & Dime," which includes fellow author and "Killing the Curse" contributor Rick Robinson on mandolin. He still hopes this guitar thing works out when he grows up. This book was fun, fast-paced and an easy read. I got sucked in early and spent the majority of an evening and into the night reading this one, as I just couldn’t put it down. The information about the games being played came across as realistically as if I was watching a game myself. 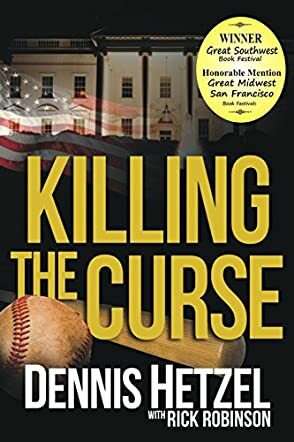 Killing the Curse is a book that would appeal to any person who enjoys reading fiction with a tie-in to sports, mysteries, or those Cubs fans who continue to live in hope that their team will actually win the big one. Dennis Hetzel has a winner with Killing the Curse, and I highly recommend this book to anyone looking for an enjoyable, exciting and absorbing read.